The average curtain is made of delicate materials or fabrics, which are not only susceptible to staining and soiling, but are almost impossible to clean or wash using conventional cleaning methods. Many people would be tempted to stick their curtains in the washing machine for a good spin, but our advice as a professional cleaning company is to spare your delicate curtains from mechanical damage caused by machine washing and use our professional London curtain cleaning service as the more effective and safer alternative. As most other pieces of fabric around the house, the curtains are also exposed to a generous dose of dust, pollen and bacteria on a daily basis. Fact of the matter is though, that conventional or aggressive cleaning treatments will leave your curtains with permanent damage such as creasing, discolouration, tearing and fading or shrinkage. It must be noted by customers that sunlight damage is not something that can be reversed even by professional cleaning treatments. Our specialised London curtain cleaning service though will prove to be highly effective in removal of stubborn stains and soiling from curtains. We will keep your delicate curtain fabrics bright and fresh at all times, as we have the equipment and practical skills to yield the best possible cleaning results without risk of damage. Usually we either subject curtains to steam cleaning or dry cleaning. In both cases, the task is approached with utmost care and precision by our cleaning technicians, who are specially trained for the job. 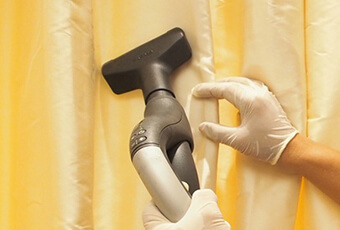 The steam cleaning process we use for our specialised curtain cleaning in London involves the application of hot, pressurised cleaning solvent which removes effectively all types of organic and chemical staining from most curtain fabrics. Then we apply hot steam in order to remove the solvent and the dirt from the curtain fabric. The equipment we use also dries the curtain as it works through it, which makes the entire process much more efficient. The other method we use for our curtain cleaning service in London is dry cleaning, or also known as restorative cleaning, and we use it for delicate fabrics which cannot be cleaned effectively in any other way. 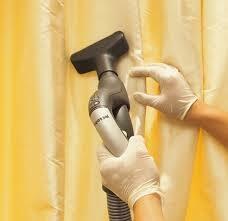 Dry curtain cleaning, as the name implies, uses a minimum amount of water in combination with dry chemical solvents. 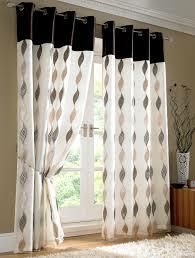 The cleaning treatments we apply are safe and suitable for all types of curtain fabrics. All cleaning procedures take place on site.